An OpenSource reason to wake up. This project was created on 03/20/2017 and last updated 2 years ago. Coffee me Up! Is an open source niilist-coffee-machine-alarm-thing. It main idea is to me up every single miserable day of my life with a good warm cup of coffee. Coffee me Up! is an opensource coffee alarm-coffee-machine that not only wakes you up every single miserable day of your life, but it does it in style! With a good ole cup of hot black coffee! Side notes, the Atmel SAME70-XPLD already comes with a RTC included in it, if that&apos;s not your case, you might be in for some extra work. There is still a lot of hard coded stuff in here, also the UI/UX has a lot to be improved on! Sorry, but it is in PT-BR! In general, all code can be found in https://github.com/coffeemeup, above is just a quick highlight of what and where you may find what you&apos;re looking for. 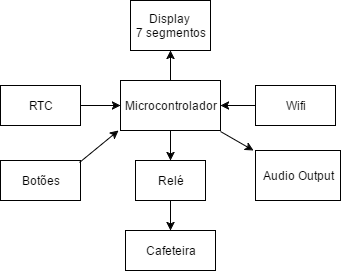 Diagrama de blocos técnico de CoffeMeUp. A simple project using avr-libc and some cheap peripherals to implement a clock which counts down to a major life event. You are about to report the project "Coffee me Up! ", please tell us the reason.